Columbus, Ohio – November 20, 2018 – Kimball Midwest, a national industrial supplier based in Columbus, has been named the 2018 Family Business of the Year by the Conway Center for Family Business. The Family Business of the Year award honors businesses that have made a significant contribution to their industry or the Central Ohio business community. Other recent recipients of the award include Ricart Automotive, Donatos Pizza, Velvet Ice Cream and White Castle. The award was announced November 14 during the center’s 20th Annual Family Business Awards and Expo at the Hilton Columbus at Easton. 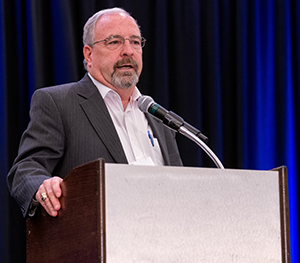 In his remarks accepting the award on behalf of the company, Chief Sales Officer Chas McCurdy said maintaining family ownership is key to the Kimball Midwest vision. “Without being involved with the Conway Center, I don’t think we would be where we are today,” he said. Kimball Midwest’s milestone 95th anniversary also was recognized during the event. The Kimball Company was founded in 1923 before evolving into what now is Kimball Midwest. Kimball Midwest is a family-owned, national distributor of maintenance, repair and operations (MRO) products that has been providing superior products and superior service since 1923. The company services sales representatives and end-use customers from its corporate office and distribution center in Columbus, Ohio, and distribution centers strategically located in Dallas, Texas; Reno, Nevada; and Savannah, Georgia. The Conway Center for Family Business is Central Ohio’s resource for educational programs, resources and networking opportunities to support the growth and success of family-owned businesses. The organization includes about 200 family-owned businesses from Central Ohio that employ more than 20,000 people. The Conway Center is celebrating its 20th anniversary in 2018.